WILMINGTON, North Carolina — The rain will not let up on North Carolina’s coast for another 24 hours — and the preliminary rainfall totals so far are staggering. The National Weather Service says more than 30 inches of rain were measured in Swansboro, North Carolina — shattering the state’s tropical cyclone rainfall record of more than 24 inches — set during Hurricane Floyd in 1999. Officials warn some rivers are approaching historic flood levels, and the worst devastation may be still to come. The death toll from Florence climbed Saturday to at least 12. Some have been killed by fallen trees — others have died on flooded roads. Nearly one million homes and businesses in the Carolinas have lost power. On Saturday, the mayor of Wilmington said it could take weeks to restore electricity. President Trump and Vice President Pence received updates on the storm at the white house today. The president plans to travel to North Carolina sometime soon. Despite a mandatory evacuation, many Jacksonville residents stayed home, CBS News correspondent Adriana Diaz reports. That means some saw flood waters rise around them. Crews that were supposed to be clearing streets of debris on Saturday were rerouted to help with rescues. Volunteers brought boats, but air support had to be called in. Coast Guard helicopters flew through the rain to reach people on Saturday in homes too remote for rescue boats. CBS News watched as Guardsmen were deployed to the ground. They said they have been pulling people from homes, from roofs. “Yeah, just people that flag us down or really need help,” said one Guardsman. Most evacuations were by boat. CBS News found this family looking for any neighbors who might need help. They said the neighborhood flooded fast. “Man, it was pretty quick — I woke up, to it was halfway up the street and about two hours later we was worried about it coming into our house,” said the father. The National Guard, first responders, and volunteers rescued dozens of people who live in low-lying areas of Onslow County, where the worst flooding is chest-deep. Some brought what they could in shopping bags, others cradled wet pets to safety. That’s why Anthony Love’s family is leaving. They’ve been here for two decades, and this is their first time fleeing floodwater. Coast guard helicopters were conducting rescues today in New Bern, an area swamped by yesterday’s storm surge. CBS News correspondent Mark Strassmann flew along with them. One by one, stranded Florence victims were hoisted 40 feet into the sky. 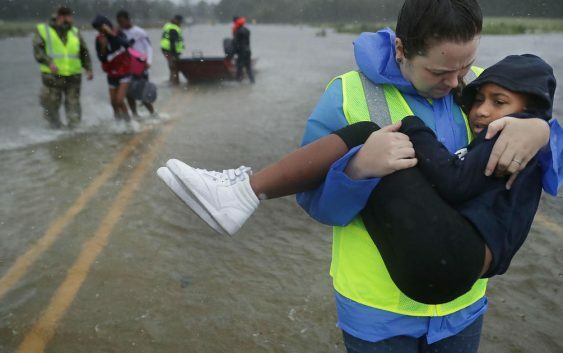 In all, 13 people, adults and young children, who had gathered in a single flooded home in Jacksonville, North Carolina. An older woman waded through waist-deep water on two crutches, and with help, crawled into the chopper’s rescue basket. Like all of them, she was safe. “We flew with the Coast Guard today as they responded to day two of flooding drama in eastern North Carolina over places like New Bern, recovering from 10 feet of storm surge,” said Pilot lieutenant Matt Delahunty. Friday’s stormy weather was too dangerous for most rescue helicopters to fly, but on Saturday, with calmer conditions, Coast Guard air crews plucked dozens of people from flood zones. Safer flying weather came just in time. Heavy rains and flooding over the next few days could mean more people who end up needing help from a rescue helicopter. Vice Admiral Scott Buschman flew with us over flooded neighborhoods. At one shelter, an evacuee had a heart attack. The shelter was surrounded by water, impossible for ambulances to reach. One of these Coast Guard helicopters flew them to a hospital in Raleigh. One of the areas Mark flew over today was the riverfront city of New Bern. Drone footage shows parts of New Bern that were submerged by a massive surge of water when Florence made landfall. Hundreds were suddenly stranded in their homes, CBS News correspondent Kris Van Cleave reports. James Karcher flagged down the National Guard as we drove through his still flooded New Bern neighborhood. More than 400 people have been rescued since Florence inundated the city of 30,000 with 10 feet of storm surge and unrelenting rain. An NYPD team carried this man who was on crutches. Entire neighborhoods were turned into islands. The mayor says more that 4,200 homes and 300 business have been damaged or destroyed. The water rescues have ended but the National Guard is now going into still flooded areas to make sure everyone is ok.
As the water receded Saturday, neighbors started returning home but some found little to salvage. Despite the massive damage and daugnting cleanup, Mayor Dana Outlaw is grateful. “You are talking about a storm knocking you down but not knocking you out? Not at all not this little community,” Outlaw said. He choked up as he admitted it’s been a touch couple of days. “I am really thinking and glad that nobody really got seriously hurt,” Outlaw said. While much of the water has receded, there are pockets of New Bern that are still dealing with a lot of water and the rain just keeps coming. First responders, service members, and the types of heroes who don’t wear uniforms have been risking their lives to save others. Amid the worst floodwaters and rain, rescuers searched for those in need. Leroy McGee joined Pastor Matthew Drake and members of their church, volunteering to check on homes in their Jacksonville neighborhood. “I was getting antsy, I couldn’t do it any longer, because i knew they needed help,” Drake said. They found two dogs and carried them back to their boat, and to safety. “That’s what i’d want someone to do for us,” Drake said. In New Bern, North Carolina, reporter Julie Wilson helped rescue a dog during a live report. As rising waters there threatened homes, Sgt. Nick Muhar, from the North Carolina National Guard 1/120th Battalion, carried the smallest member of an evacuating family. Firefighters in Wilmington, North Carolina responded to the worst of the storm, which claimed the lives of a mother and her infant. More than 500 people were rescued throughout New Bern and Jacksonville by first responders and volunteers. 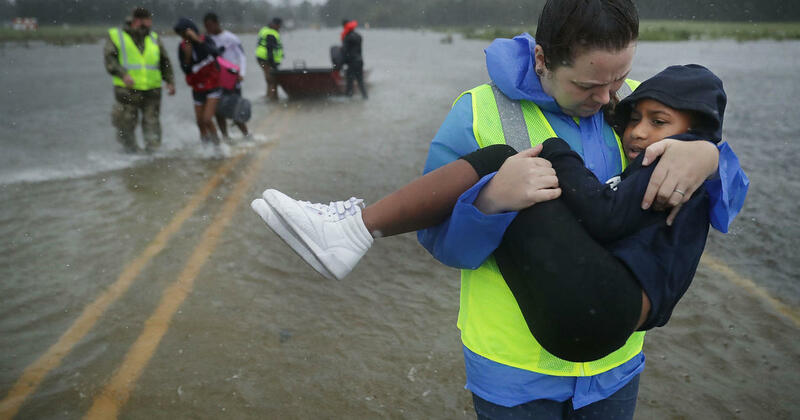 Throughout the Carolinas, rescuers responded to Florence by boat and on foot, carrying the most vulnerable to safety.